Cities are infinitely more than meets the eye. Yet it is what our eyes can see, for our minds to measure, that cements so much of the understanding of our world. In a quest of understanding urban complexity how do we visualise this Urban that we cannot at first see? through what tools? and how do we, in making the invisible visible, challenge established perceptions, opinions, and beliefs? The journal is calling for submissions in text-, image-, and video-based formats, that sharpen, broaden, and challenge our ways of seeing the City, critically reflecting on the transformative potential of urban visualisations. 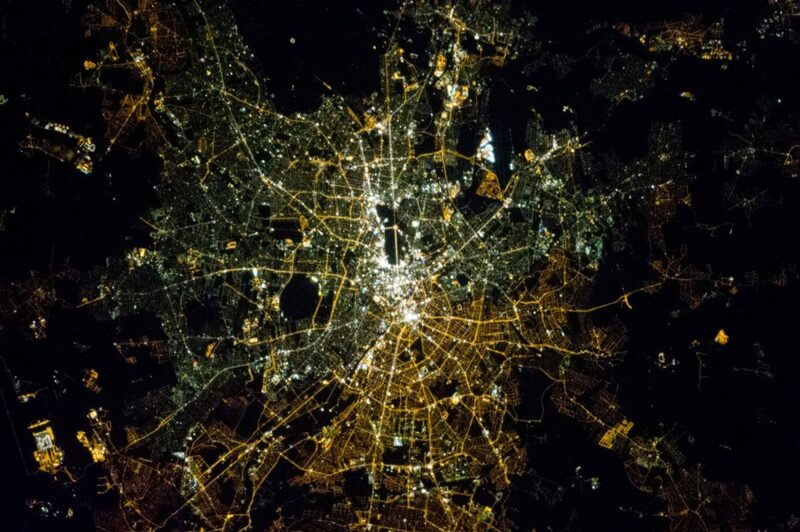 Image notes: Chris Hadfield’s photograph, taken from the ISS, 200 miles above the earth, illustrates, more than two decades after the collapse of the Berlin Wall, the East-West division of the city: fluorescent lamps cause a brighter, whiter glow, in western Berlin while sodium-vapour lamps, unchanged since the Cold War, give off a softer, yellowish hue, in the eastern part.